August 26, 2015 – *As a blogger on Human Rights issues in Yemen for the past six years, I am stunned by the growing polarisation in the country; to take an even-handed stance for human rights is either viewed as treasonous act, or as a sectarian bias. If you criticise both the Saudi-led Arab coalition air strikes and the Houthi-Saleh alliance forces, the supporters of both camps accuse you of supporting one side over the other. It’s us or them, both sides maintain; no middle ground. Throughout my activism, it was easy for me to remain in that middle ground due to my mixed Ethiopian-Yemeni background which influenced my strong faith in fundamental human rights for all people, regardless of their color of skin, ethnicity, gender, religious belief, etc. Having myself lived some of the ugly consequences of the abuse of human rights, in my case, that is racism, I developed a great sensibility of Yemen’s identity politics. Today, I perceive how people's definition of their identities in Yemen - whether in line with tribal, sectarian or class-based affinities - is realigning itself along with the new political order. Growing up in Yemen, a country with a strict hierarchical class system was not an easy thing, especially for someone like myself with mixed-ethnic identity. My story, like the story of many multi-ethnic Yemenis, goes back to the time when my two Yemeni grandfathers, frustrated by the economic and political situation, had a leap of faith and left Yemen to find a better life elsewhere. Yemeni ports served as a conduit for migration. Due geographic proximity, the African horn was the destination for many migration waves coming from Yemen. Going east was also a popular destination for southeastern Yemenis. For my northern grandfathers Ethiopia was the choice of destination. They settled and married two Ethiopian ladies (my grandmothers) and had children (among them are my later-to-be my parents). It is estimated that there were 300,000 - 400,000 Yemenis in Ethiopia at that time. Following the revolution of 1962 in north of Yemen, the revolution of 1963 in its South and the dictatorship of Mengistu in their host country, many Yemeni migrants, including my grandparents, decided to go back to their home country in the 1970s. Some were forced to go back to Yemen by the emergence of communism in Ethiopia and its nationalisation policies that ripped them off the little wealth they worked hard to create, yet some were lured by the political change that had taken place at home. With a revolutionary perspective, Yemen’s former president, the late Ibrahim Al Hamdi was a key figure in calling on Yemenis abroad to return as he embarked on the road of nation building. Thus, my Yemeni-Ethiopian parents migrated back to Yemen. Read more. *Four months on and the war in Yemen still raging fiercely. Across the country, there have been over 19,000 casualties - people killed and injured - as a result of the increased violence, and the number of displaced has grown to over 1.2 million. These numbers continue to rise alarmingly as I write. Yemen, this devastated place, torn by the violence has victims unfairly perceived and treated as unworthy by all warring sides. No place in the world should allow victims to be unworthy. Looked in more details, different sides in the conflicts have different worthy and unworthy victims. This is not to underestimate the aggression coming from other sides whatsoever, but rather for the sake of chronicling the violent episodes in Yemen’s ongoing conflict, the Houthis’ aggression comes first. Citizens in the southern part of Yemen in particular have been treated as unworthy victims by the Houthi movement’s militias and its ally, the ousted former president, Ali Abdullah Saleh’s forces since they started bombarding president, Abdurabu Mansour Hadi’s house and Aden airport on the 19th of March in Aden (before what we all know today as the start of the Saudi-led airstrikes on Yemen). After Hadi fled the country, Houthi/Saleh’s forces started targeting people in the south systematically on the pretext that they are takiris and al Qaeda in the south of Yemen, then they shifted their propaganda to state they were fighting ISIS (Da’ash). All these slogans have ripped off southerners’ worthiness in the eyes of the Houthi/Saleh’s forces. At the same time, Houthis mastered stressing on local and international media alike how the Saudi-led coalition is murdering its own citizens in northern Yemen while overlooking their atrocities in the south. For Houthis, the victims of the Saudi-led airstrikes are the only worthy respect and attention victims. On the other side, southern resistance fighters perceive and treat Houthi victims as nothing but unworthy, why? because the antagonism has reached irreversible point. It’s astonishing how these stances are remote from any moral principle. More importantly, despite its fragile status, the state, the Yemeni republic of the people has been the greatest unworthy victim by Houthis attempted coup d'etat against president, Hadi in September, last year. Houthis have been cracking down on its dissidence, which includes Hadi himself, ever since their expansion from Sa’adah to Sana’a in July last year. Specifically, since September, 2014, there have been dozens, if not hundreds, of civic activists, journalists, human rights defenders across Yemen who got harassed, abducted and tortured - some to death - by the Houthi militias in their own bloody purge... read more. This is not from today's newspaper. This is from 1994. How much history repeats itself? source: the Financial Times. May 14, 2015 – Last week, I read one tweet that was a mere copy-past by a Yemeni columnist who was copying another Yemeni columnist's tweet. The first was in Arabic, the latter was in English. I felt sorry; what a plagiarism, right there, where we all can read it: intellectual bankruptcy. But the truth of matter is, there is nothing left to say about Yemen's real dystopia. Everything has been said and in vain. Perhaps, this attitude won't help at all, you need to snap out it, Afrah. No time for despair. – I tell myself. Yes, maybe it's time even to say that there is nothing left to be said. And that we're just repeating the same message over an over while the misery seems unstoppable. But maybe it's helpful to just reflect & explain some random thoughts. The country has been collapsing since the start of 2011 and today's reality probably the real big change that will transform the future drastically. The cost for the change is so heavy that each household would pay. Including those outside of Yemen. Yemen today is in a position where it's trading off a drastic change with a fake lasting peace. Before the war, was Yemen in a better position? 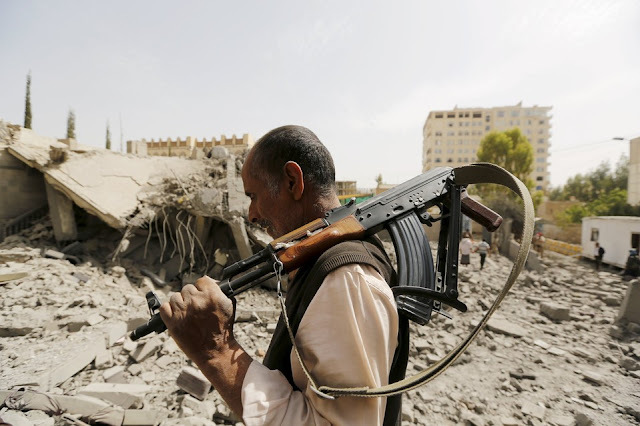 was Yemen enjoying a formidable stability? Yemen's peaceful reality was weary and more of a cold war. Across Yemen, there were people facing death on a gradual scale by so many direct and indirect causes, which was swept under the rug. Saleh was & still is responsible of massive atrocities, just like how Abdelmalik al Houthi did & still does since he led the coup in September 2014... read more. May 3, 2015 – There is so much going on in Yemen as I speak, and talking about the right to free press might be considered totally irrelevant. Yemen is at war and Yemenis are struggling to have the right to peace and life. The war has been waged almost six weeks ago after a coalition of 10 Arab countries headed by Saudi Arabia started operating a campaign of airstrikes against military targets in Yemen and simultaneously there is a fierce internal armed fights between several domestic factions. As the war is taking place, a great deal of citizens’ rights are violated and no doubt the right to free information and freedom of expression are violated as well. Actually, it’s hard to know where to start in analyzing the current condition of press freedom in the country in the light of the ongoing war. Nonetheless, here is my attempt. 2014, in particular has been a chaotic and harsh year for free press in Yemen and it continues to be so as the ongoing multi-facets conflicts are taking place in the country. Yemeni journalists are facing mounting dangers in practicing their job and facing grave threats to their own lives in the light of the ongoing violence and the authoritarian style of leadership shown by the new ruling power now at the hands of the Houthi’ militia group, who came to power, or still fighting to have full power, since their coup against president Hadi and his government carried in september last year. 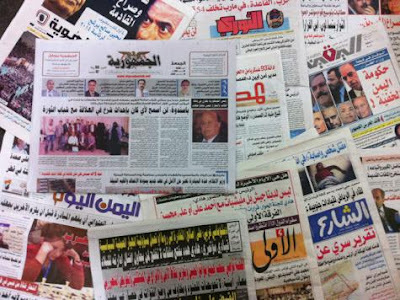 Generally speaking, before the coup, press in Yemen could be described as partisan press: journalism outlets usually worked along with political party lines. Today, the press is heavily used as a tool for propaganda and instigation of animosity and hatred). Having said that, Clearly, the war’s implications would also have a grave impact on how the press’ future would look like. In the wider view over the current condition for media in Yemen: it is important to note that Following Yemen’s Uprising in 2011, there was a relatively boom in the field of media in the country: Despite widespread illiteracy, by last year, Yemen had around 90 newspapers published weekly or more often and the state's monopoly on broadcasting had been broken; there were several privately-owned Yemeni TV channels (some of them based outside the country) plus a number of radio stations. As elsewhere, there had also been a rapid increase in citizen journalism, including often well-made videos posted on YouTube(1). And investigative journalists –represented as watchdogs of democracy– they were doing courageous reporting where they were becoming as whistleblowers of corruption cases linked to powerful governmental institutions and exposing powerful governmental and non-governmental figures... read more. March 25, 2015 – Hussein is 9 or 11 years old. His slim body holds a smiley face with glowing eyes. 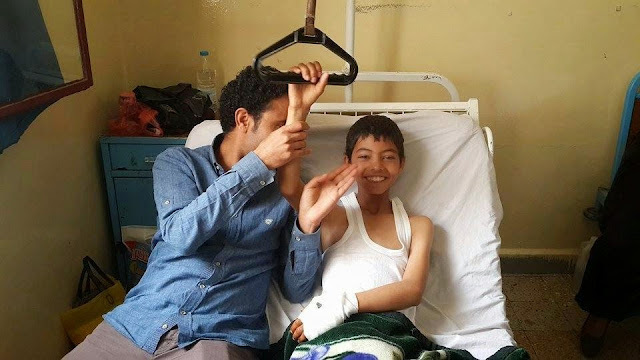 As he lays on his bed at the hospital, he finds joy in describing how he miraculously survived the the twin-bombing attacks in Sana'a, last Friday, 20 March. "as we just finished praying, I found myself thrown into the wall," Hussein recalls to his uncle the moment the suicide bomber exploded, "as if a strong wind blew me away 'boom'. Then, I tried to get up and I saw my hands and legs full of blood." Hussein survived to be a witness of that day and to tell us with a big smile and despite the pain how he was given a second chance to live..
Death is no longer looming in Yemen; it is definite. Each Yemeni house has at least one who was killed, injured or at least knows of someone who was killed injured during the course of the latest violent upheavals. I lost a distant relative myself in this mosque bombing. It makes you realize how death is so close and God knows who'll be the next victim of the next bomb? or strike? or..? Maybe that explains why instead of talking to the press, I always prefer to spend my time vibering and talking to family and friends in Yemen – there is always that slight possibility that this might be the last time we'd be talking to each other... read more. March 13, 2015 – It’s no longer Spring in Yemen. The consecutive upheavals have been nothing but stormy for all. Yemen is stuck in a vicious circle of failures. My generation has had to live with periodical armed conflicts and is trying to deal with the trauma. The trauma impacting women is especially complex because women suffer not only from everyday human rights violations but also gender-based violence and discrimination. For Yemen — the country ranked absolutely worst in the Global Gender Gap reportevery year since 2006 – the old imperfect reality for women might be considered the old good days. Today’s reality is quite possibly the bleakest. The latest upheaval is Houthi takeover of most of Yemen’s large cities. This has created an extreme sense of insecurity, fear and economic frustration. President Abdu Rabbu Mansour Hadi hardly protected himself from the Houthi’s aggression, let alone ordinary citizens. Unquestionably, a critical implication of the Houthi’s new imposed social order is that all human rights are under threat in the cities controlled by them. Women’s rights are particularly endangered, unless Yemeni women reorganize with a clear (Islamic/secular) feminist conscious... read more. January 5, 2015 – I suggested that we make together Kushari for dinner, and she agreed. It was snowing outside as we juggled between fixing the ingredients for the demanding Kushari. Chopped and fried onion, check. Cooked rice, check. Boiled lentils, check. The tomato sauce, check. The macaroni, check. The chickpeas, check. The Kushari sauce, check. Oh! that multilayered-ness. Even though making Kushari is time-consuming, we managed together to make it quickly and we were happy with the final result as we all sat down & dined. That was my fourth consecutive and last dinner at dr. Elham Manea's, over the past Christmas holidays. The Kushari seemed to be more than just an ordinary choice for a meal. It was a manifestation of the endless conversations we had: Yemen, Europe, immigration, the quest for dignity, Pan-Arabism, making peace with alienation, realizing that home has no geographical location, Da'ash, Al Houthi.... you name it. Simply, the Kushari did not only resembled our multi-layered talks, but it was also our contribution in Arab-izing our hangout in Europe. 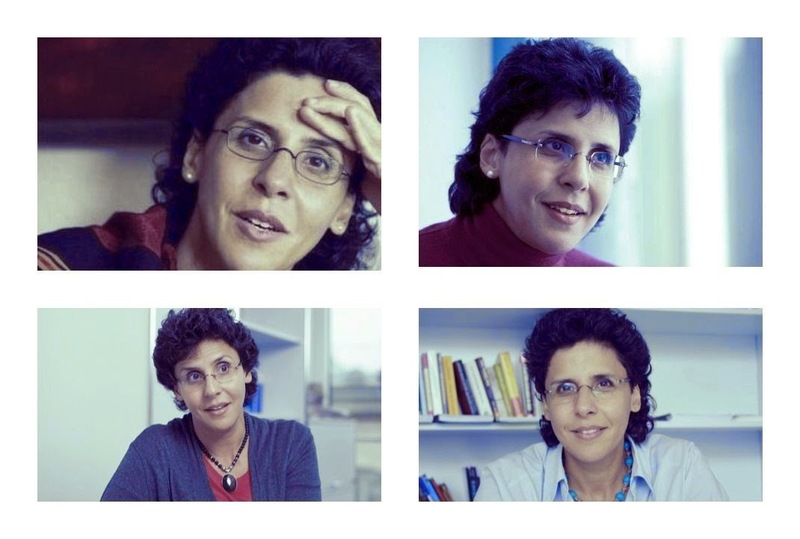 Manea humbly describes herself as a Yemeni-Swiss writer and Human Rights activist. Trust me, she's more than that. The immersed into political science Manea needs to be described as a theorist and thinker... read more. December 11, 2014 – Heba Al-Thabhani, a college student at Sana'a University started a storm of resistance to Al Houthis' hegemony of the university's campus since she was assaulted and threatened to be stripped off by Al Houthi men, on the 2nd of December. The current typical dress code for women in most of Yemen's big cities, including Sana'a is to wear a long black dress with long sleeve, usually called "Baltoh" (like a maxi dress) that covers the entire body. There are a handful of women who don't wear the Baltoh. And Heba decided to join the exception by wearing a modest jacket along with a trouser. Then, as she was going to her university, her unusual appearance provoked Al Houthi armed men who have been occupying the campus in the wake of their takeover of Sana'a city, on 21st September (an update!). Heba was interrogated by the armed men and asked to abide to the typical dress code for females in the city. As she refused to be submissive, she was threatened to be stripped off her trouser. It's not certain if they would have really done so, but it's certain that they wanted to scare her and terrorise her. Al Houthi are religiously strict group and Heba's dress definitely doesn't go in accordance with their religious considerations... read more. August 26, 2014 – It takes a lot of effort to process the load that comes with being a Yemeni citizen—whether you are inside or outside the country. You’re constantly trying to walk as a normal person, despite the inner and external hurdles. The world sees you in a pre-defined frame and you even struggle to perceive yourself in a refined view. Headlines in media reveal a gloomy side of Yemen, which has a great extent of truth, and we are portrayed as a land that exists outside the planet. That was an actual suggestion in one of the American TV series, Supernatural. Hence, any attempt to attest that we are more than those portraits becomes extremely hard. Why does Yemen have to endure all that? I wondered. I thought it would be interesting to search for an answer. I typed in simple search terms into Google (i.e. Why Yemen) and looked into what the auto-fill completed. I ended up with these autocomplete results: “why Yemen is poor,” “why Yemen is important,” “why Yemen is not included in GCC,” and “why Yemen is a failed state.” Then, I regretted my initial question because those questions by Google were not simply arbitrary questions. They were statements. August 18, 2014 – Would anyone be blamed if they lost faith in the Arab world? War, extremism, sectarian strife, abuse of power... There’s no hope, is there? A Yemeni activist begs to differ. I no longer like overhearing stranger Arabs as they pass by me in the street, or when I sit in a cafe or when I'm in the train. I just change the place or rise up the volume of the song I'm listening to with the headphones in my ears. I'm good today in embracing my Afro-look, with my curly hair, aiming to pretend I'm not an Arab at all. It's compelling and odd how we Arabs recognize each other from a distance. I can recognize other Arab from a glimpse. I'm quite often recognized as a Moroccan girl by other Arabs. You should see the shock in their face when I tell: I'm from Yemen. I do my best not to overhear them because it's always about politics. I'm not saying that's not my favorite topic but I'm saying it literally will drive me crazy... read more. June 16, 2014 – Credited with ousting their country's former dictator in 2011, those Yemeni revolutionaries seriously wounded by the police are left untreated. Are Yemenis that ungrateful? In the wake of Yemen's 2011 uprising, it's estimated that 29,000 demonstrators were reportedly injured during the protests. Of those, around 2,000 have needed medical care abroad, but only 450 have been sent out of the country for treatment, and dozens have died due to absence of any medical treatment. A great deal number of them are still suffering from serious injuries they sustained during the security forces' violent crackdown then. One of the wounded demonstrators, Tamer Rasam, 19, passed away at Sana'a's Change Square on the 1st of June for not receiving a medical treatment- a treatment that the government has promised to provide for all the uprising's wounded people... read more. February 27, 2014 – In the third anniversary of her country’s revolution, Yemeni expatriate blogger Afrah Nasser looks back at how the uprising changed her life. An emotional account of homesickness, hope and resilience. Today is the day when I want to be home in Sana'a so bad. Today, Sweden is like a big jail and I'm so remote and feeling the alienation. Today, no place feels home at all other than Yemen. Today, we Yemenis in the Diaspora are immersed into social media networks and mainstream news, reading and watching anything that's related to today's epic celebratory demonstrations across the country. Today the urge to be home is painfully at its peak. Our wishes to be there at this day are countless. It's the third anniversary of Yemen's uprising and people are celebrating across the country, rallying with various political demands. I'm proud of the people's continuous momentum but I'm also pained that I'm far away. It brings tears to me, knowing that I'm there in heart but here in body, and knowing that my homeland is transforming into federalism. I'm puzzled if I'd ever recognize what I once left. I don't know why it's this sad a day for me. Maybe because it's February, the darkest month of the year in Sweden and winter blues' effect is kicking in. Or, because my emotional support mechanism is almost none. I have been living without a family for the past three years in Sweden. It gets awfully lonely over here. I try to adapt but it's never easy. I struggle with “fitting in” at school, at my masters' degree classes. It's also not easy. Nevertheless, blogging is what makes life meaningful, really... read more. April 29, 2013 – Past generations of Yemenis have watched as their country descended the ladder of gender equality. Luckily, Yemen’s young activists are stepping up and speaking out. “The Uprising of Women in the Arab World” (TUWAW) Facebook page has accrued over 100,000 followers since its inception in October of 2011. The page invites users to follow trending activism issues and engage in international dialogue concerning topics relevant to Arab women. While I know the page is regularly updated by posts from around the world, it shocked me to learn that the highest number of contributions came from Yemen – a country long accustomed to the murky bottom of the discrimination-ranking Gender Index. Considering how limited Internet access is in Yemen, the feat deserves extra plaudits. Apparently Yemen is pushing back against the gender inequalities that make it difficult for women’s success. Co-founders of TUWAW’s Facebook page and international movement, Yalda Jounes, Diala Haidar and Farah Barqawi, confirmed the incredible Yemeni response during a Women Bloggers Conference in Morocco last week. They noted that most of the posts come from a surprisingly wise pool of Yemeni youth. The posts by these youngsters adroitly reflect on the serious social grievances Yemeni women endure, including child marriage and sexual harassment... read more. 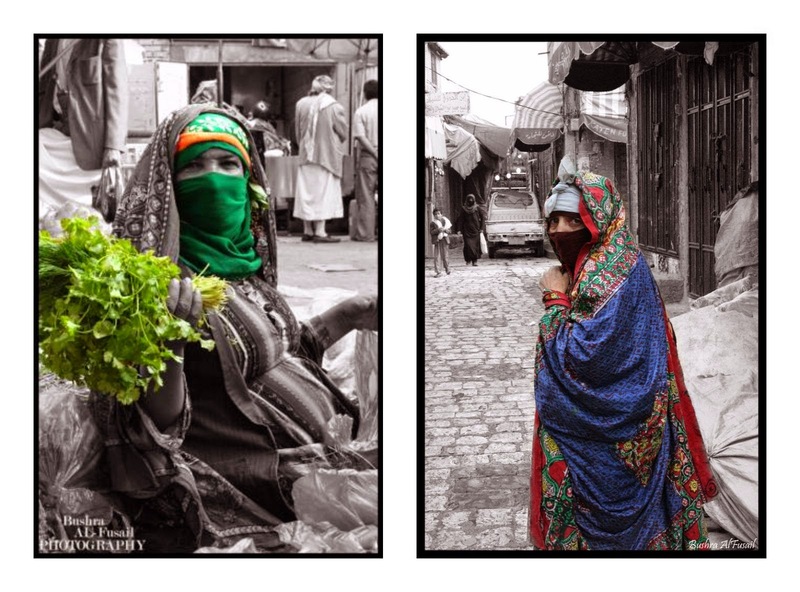 May 4, 2011 – Before I begin to write this post, I'd like to point out that women in Yemen NEVER eat or drink publicly at local cafeterias in Yemen's provinces. Now! In the cute photo above is me (in pink) along with wonderful ladies; one of Yemen's leading female photographers, Boushra al-Mutawakel (with the eye glasses), my French friend Cloe (with bluish headscarf) and the fantastic Arwa Othman (who's taking the photo), founder of House of Heritage. We all were at a cafeteria where women are not supposed to sit at! We went to the Change Square, last week. We walked around for awhile and decided to take a break. Arwa Othman invited us to have some tea at one of the cafeterias there. "That's unacceptable! Can we do that!! But those cafeterias are only for men, no? ," I asked. "This is our new thing. Girls, women and I decided to have a new ritual at the square and have some tea where men do. The square is for all the people; men and women. Just sit and enjoy your tea, girl!," she answered. 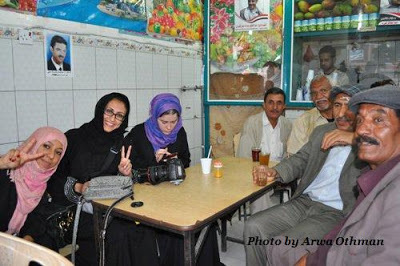 This is the new Yemen, everyone ^_^ The Yemen where women could enjoy sipping tea at "men's" cafeteria.